Compassion is the very essence of a spiritual life and the main practice of those who have devoted their lives to attaining enlightenment. It is the root of the Three Jewels – Buddha, Dharma, and Sangha. It is the root of Buddha because all Buddhas are born from compassion. It is the root of Dharma because Buddhas give Dharma teachings motivated solely by compassion for others. It is the root of Sangha because it is by listening to and practicing Dharma teachings given out of compassion that we become Sangha, or Superior beings. What exactly is compassion? Compassion is a mind that is motivated by cherishing other living beings and wishes to release them from their suffering. Sometimes out of selfish intention we can wish for another person to be free from their suffering; this is quite common in relationships that are based principally on attachment. If our friend is ill or depressed, for example, we may wish him to recover quickly so that we can enjoy his company again; but this wish is basically self-centred and is not true compassion. True compassion is necessarily based on cherishing others. Although we already have some degree of compassion, at present it is very biased and limited. When our family and friends are suffering, we easily develop compassion for them, but we find it far more difficult to feel sympathy for people we find unpleasant or for strangers. Furthermore, we feel compassion for those who are experiencing manifest pain, but not for those who are enjoying good conditions, and especially not for those who are engaging in harmful actions. If we genuinely want to realize our potential by attaining full enlightenment we need to increase the scope of our compassion until it embraces all living beings without exception, just as a loving mother feels compassion for all her children irrespective of whether they are behaving well or badly. This universal compassion is the heart of Mahayana Buddhism. Unlike our present, limited compassion, which already arises naturally from time to time, universal compassion must first be cultivated through training over a long period of time. 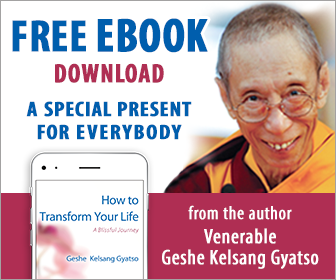 To find out more about compassion, see the books Eight Steps to Happiness, Universal Compassion, and Meaningful to Behold.